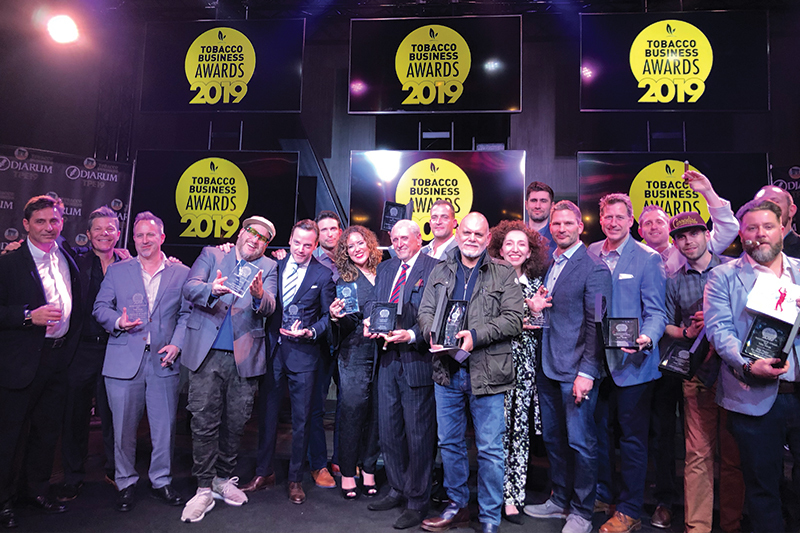 Tobacco Business Magazine held its second annual Tobacco Business Awards at an exclusive invite-only ceremony held in Las Vegas on Feb. 11, 2019. This year’s event took place at The Sayers Club within the SLS Las Vegas Hotel & Casino and had close to 270 premium tobacco retailers, manufacturers and media in attendance. Held in conjunction with the Tobacco Plus Expo (TPE), the Tobacco Business Awards was designed to honor and recognize exceptional businesses, professionals, and products of the tobacco, vapor and alternative industries. This year’s ceremony was a full-on featuring of who’s who within these industries as the magazine announced the winners of the 2019 awards. This year’s awards expanded to 12 categories that could be voted on by the magazine’s print and digital readers and one non-publicized award given to an industry icon that was announced and revealed for the first time during the ceremony. New categories introduced at the 2019 awards included Nicaraguan Cigar of the Year, Dominican Cigar of the Year, Boutique Cigar of the Year, Accessory Manufacturer of the Year, Tobacconist of the Year and Woman of the Year. This year’s awards had close to 8,000 votes, nearly four times the votes of the 2018 awards. Liana Fuente is the very first recipient of Tobacco Business’s Woman of the Year award, an honor Fuente doesn’t take lightly but also one she doesn’t accept without acknowledging not just the other women who were nominated but all the others who have contributed to the tobacco industry in general. Liana Fuente was born into the cigar industry. When thinking about her childhood, cigars were as much a part of her family’s everyday life as food and water. She had many great mentors in the business, including her father, Carlito, her grandfather, Don Carlos, and her great-grandfather, Arturo, who showed her that hard work does pay off. In addition to being inspired by male figures, the women in her family have also shaped Liana’s approach to business and entrepreneurship. Fuente acknowledges the other women nominated alongside her this year, describing them all as strong and amazing, and saying that her win is also theirs. For the Fuente family, which has a long history in the premium cigar space that dates back over 100 years, her recognition as the first Woman of the Year is something she says they are very proud of. Carlito travels the world spreading love and telling the Fuente family story to all. This has inspired us to bring something fun to you. Please take your “EL PAPO DEL HUMO” bobblehead and spread some love all over the globe. Take pictures with ”Carlito” in the most exotic and creative places or anywhere you think he may be. Whether next to the Statue of Liberty, sky diving off the Grand Canyon, or just having “Carlito” next to man’s best friend, let us all have fun! The best creative pictures posted on Facebook and Instagram will have an opportunity to win fun monthly prizes!!!!! Let the fun begin!!! Casa Fuente inside the Forum Shops at Caesars was the setting for the 100th anniversary of Arturo Fuente Cigars on Saturday night. Participating in the celebration were Carlos Fuente Jr., Cynthia Fuente and Liana Fuente as well as Eric Newman of J.C. Newman Cigars, Michael Frey of FreyBoy Tobacco and Meera and Sathya Levin of Holts Cigar Co.
Undefeated featherweight boxer Miguel Angel Garcia joined the festivities following his TKO over Jonathan Victor Barros earlier in the evening at Wynn Las Vegas. January 17, 2018 marked a historical moment for the oldest family in the Santiago Freezone, as the next generation was asked by Carlito Fuente to break ground at the exact location of the new Arturo Fuente Box Factory. This state of the art 69,000 square foot facility will be the home of many new and exciting projects. Dubai – 2nd December – After the immense success of the King Power “Arturo Fuente” unveiled in 2012, Hublot is today celebrating the international launch of the ForbiddenX watch in Dubai. Ricardo Guadalupe, CEO of Hublot, and Carlos Fuente Jr, grandson of the cigar factory’s founder, made the journey especially for this occasion, accompanied by Marco Tedeschi who represents Hublot in the Middle East. 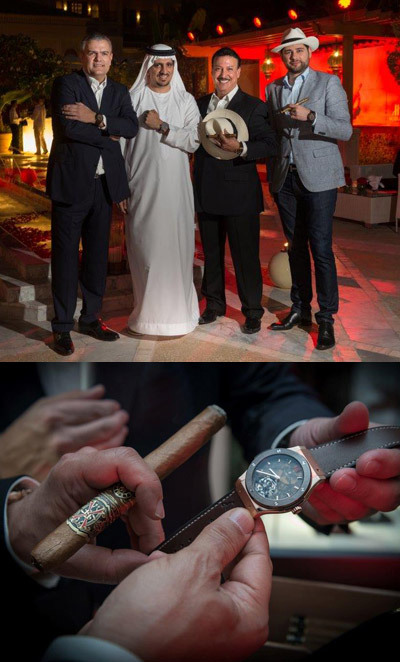 They met for an exclusive event which brought Dubai’s greatest cigar connoisseurs and major watch collectors together at the One&Only The Palm hotel, where the ambiance of the famous Château de la Fuente was recreated for the occasion, with its distinctly Cuban flavour. Whilst enjoying music and cuisine evoking Old World Havana, the guests, all sporting their Hublot Panama hat and with a fine ForbiddenX cigar, were able to discover the watches developed in close collaboration with the Fuente family, who are very proud of their Cuban roots. A unique moment. Download Full Press Release and Specifications Here. Thank you for joining us at the 2014 Variety International – the Children’s Charity World Conference to celebrate successes, share ideas and build Variety. We enjoyed seeing everyone live, laugh, and learn together. We lived by experiencing the many charms of Barbados, its rich culture and beautiful people. We laughed with friends, both old and new. We learned how 2014 will be a year of growth and success from pertinent guest speakers, an in depth grants program session, and relevant breakout sessions. Together at the conference we communicated, cooperated and collaborated to enable every Variety tent that “little extra” to be extraordinary for the children and communities we support. 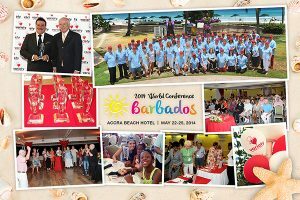 Special thanks to Variety of Barbados, VI Board, various committees and Mitch Harris for all your outstanding contributions and support to make this conference an affair to remember. The air was thick with cigar smoke, the shop crowded with loyal customers, as David and Renee Meyer celebrated Milan Tobacconists’ 100 year history. The day included recognition from state and local leaders, and emotional moments from the current owners. Renee Meyer’s father purchased the business from the Milan family in 1994. 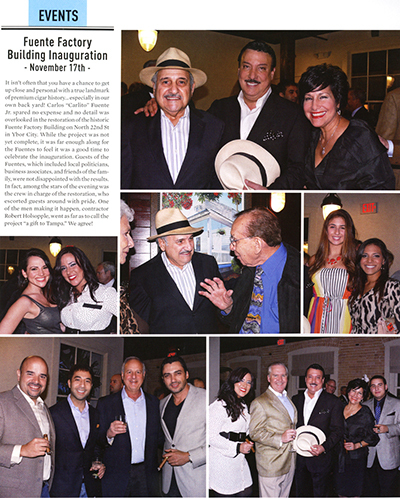 The guest of honor was Carlos Fuente Jr., the President of Arturo Fuente & Company, one of the world’s leading makers of premium cigars. His company is also celebrating its 100th anniversary in 2012. Despite the struggles that every small business faces, and challenges that are specific to the tobacco industry, Renee and David Meyer are optimistic that quality products and personal service will continue to pay off. And while a special guest signed cigar boxes, and customers lined up to buy his products, the Meyers were opening a new chapter in the history of an enduring local business. 20 years ago an Opus fan, but for the last 15 a regular Don Carlos or Hemmy. 3-4 years of age seem to be in my wheelhouse with the exception of the DC Lancero. The older the better. If the Pussycats were readily available I’d smoke a lot of them. Consistency in staple products such as the Don Carlos and Hemingway are what I can expect, every time I reach for a Fuente. Good fresh, great aged, I choose a Fuente cigar on those special days. Fuente cigars taste like fine tobacco is supposed to taste and offer a fine cigar suitable for any occasion or budget. Cut my teeth on the Hemi Classic back in 91′, love the Short Story for a quickie but always seem to gravitate to the Classic, just smooth! © 2019 Fuente Marketing Ltd.
All trademarks and logos are the property of Fuente Marketing Ltd.
Arturo Fuente cigars are consistently rated among the best cigars in the world. Our reputation for unsurpassed quality, with both flavor and construction, has amassed a loyal following among cigar connoisseurs.